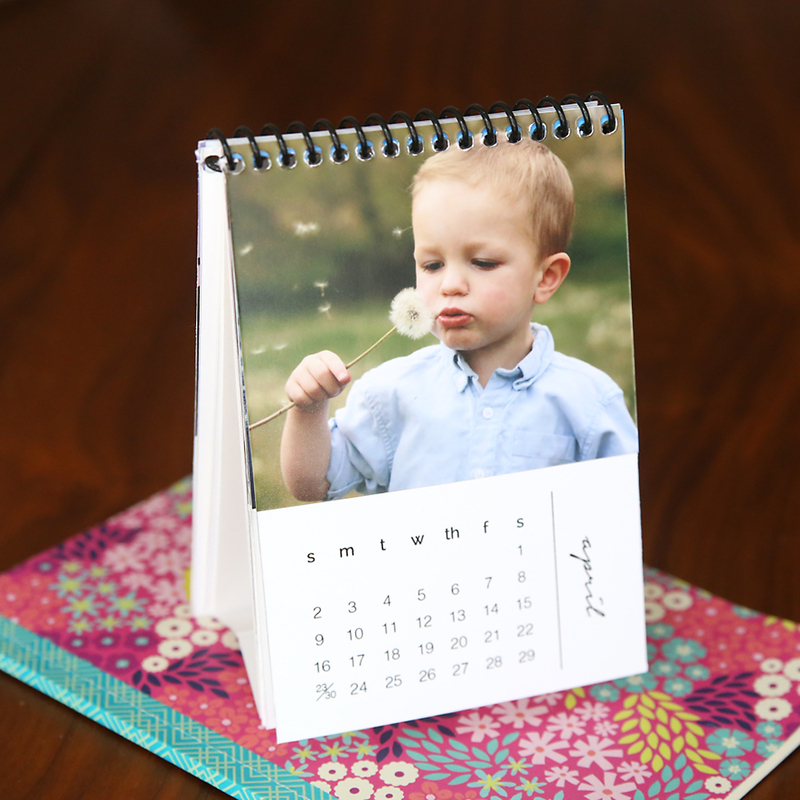 A personalized DIY photo calendar makes a gorgeous gift! 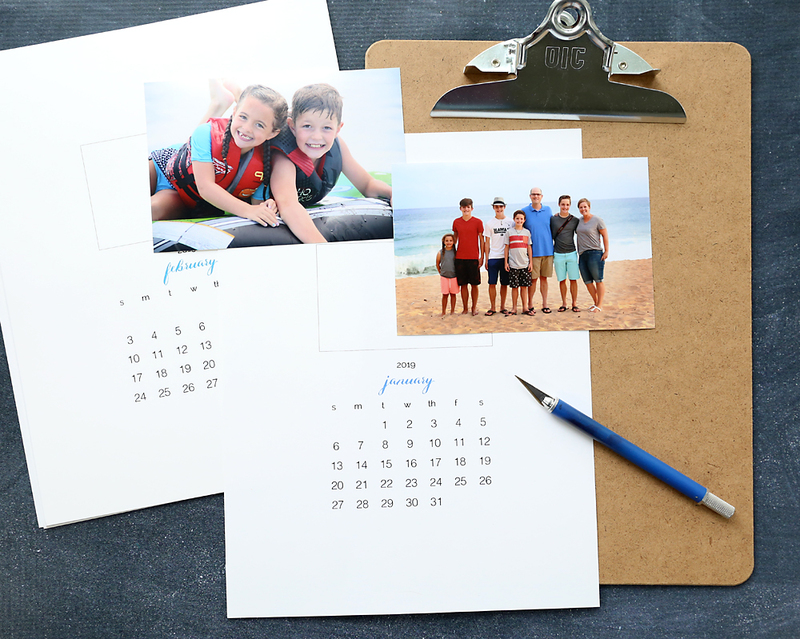 Download the free 2019 calendar page printables and add your own photos for an easy gift that only costs a few bucks. If you’re a long-time reader of the blog, you’ve seen this calendar every year since 2015! 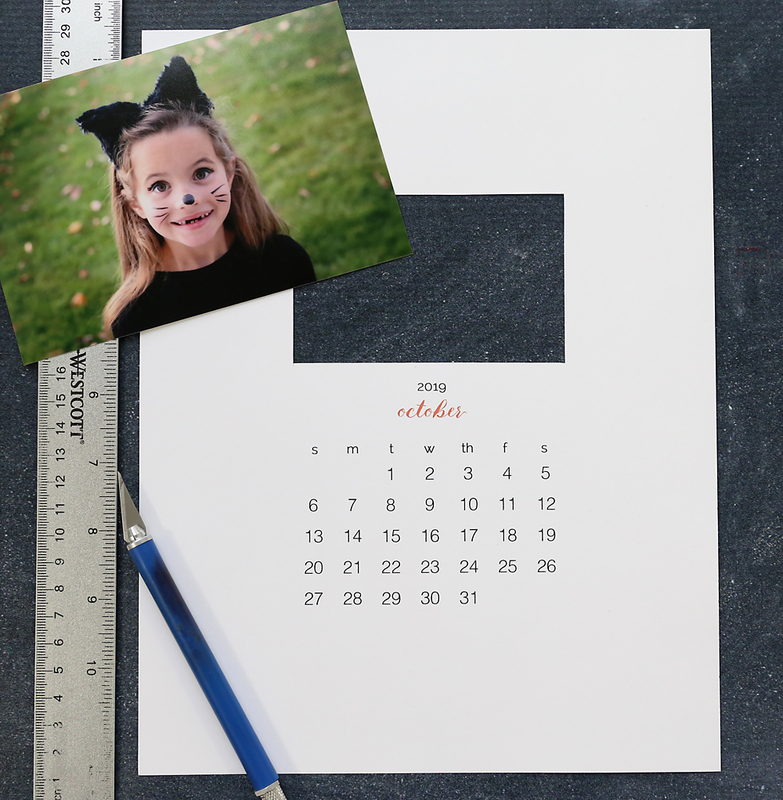 I don’t usually make the same thing multiple times, but the printables for this DIY photo calendar have been popular enough that people ask for them every year. Thanks! 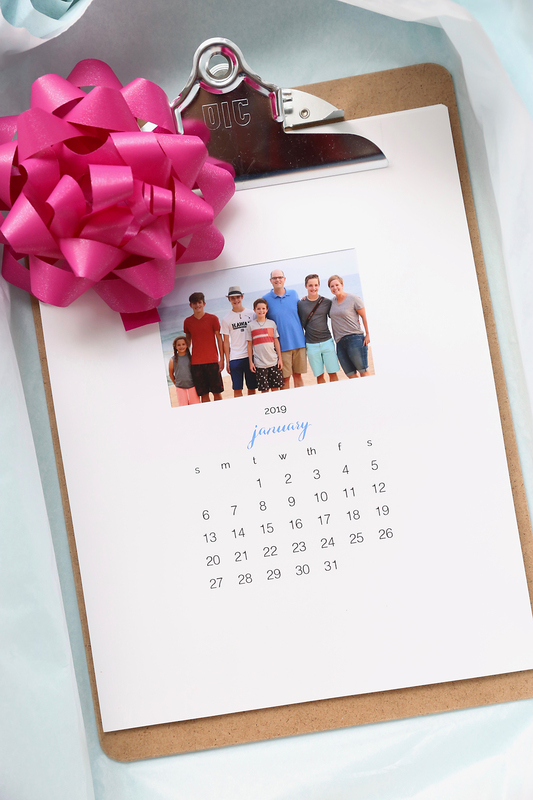 All you have to do make your own personalized calendar is to print the pages I provide on cardstock, cut out the photo window, tape a 4×6 photo behind the window, and stack all the pages together on a clipboard or in a document frame. You have a gorgeous personalized handmade gift that only cost two bucks and took under 15 minutes to put together. 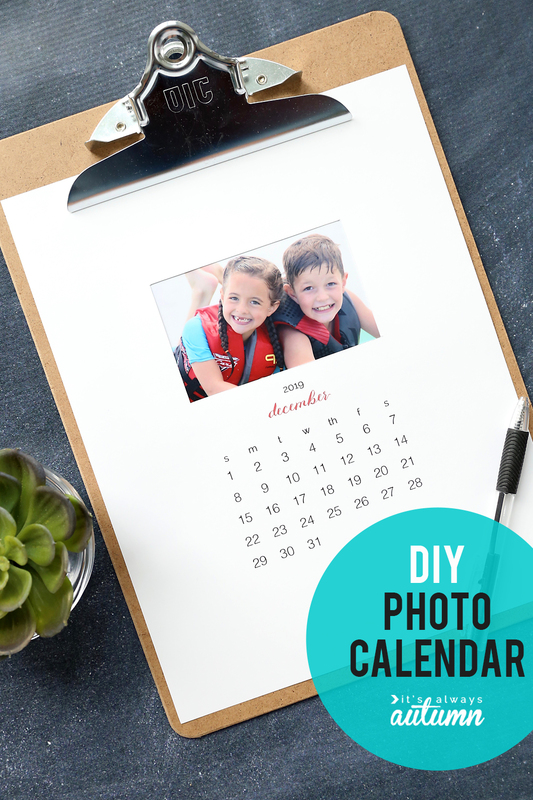 Use pics of your own kids to make a calendar for your spouse, or old family photos to make a calendar for your mom, or even pretty scenic pictures you can find free on the web (and I’ll tell you where) to make a calendar for coworkers, teachers, or anyone else. 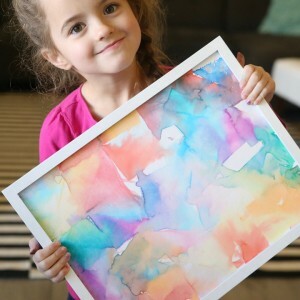 To make a 2019 DIY photo calendar, you’ll need to download the free printables by clicking here. Print them onto sturdy cardstock at 100% or full size. 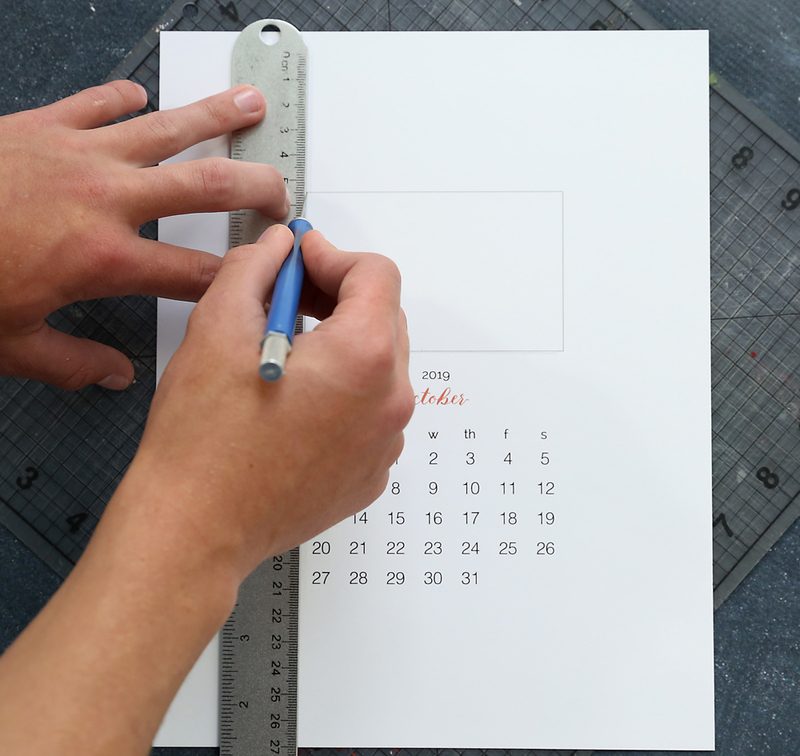 Use an exacto knife and ruler to cut out the box on each page of the calendar, then attach a 4×6 photo behind it. Cutting a window out of each calendar page looks cool because the calendar page now “frames” the photo, but if you want to make things really easy you can skip cutting out the box and trim a photo to just larger than 4.5 inches wide and 2.75 inches tall and adhere it over the box instead. Once all the pages are complete, slide them into a clipboard and you’re ready to give your handmade photo calendar away! 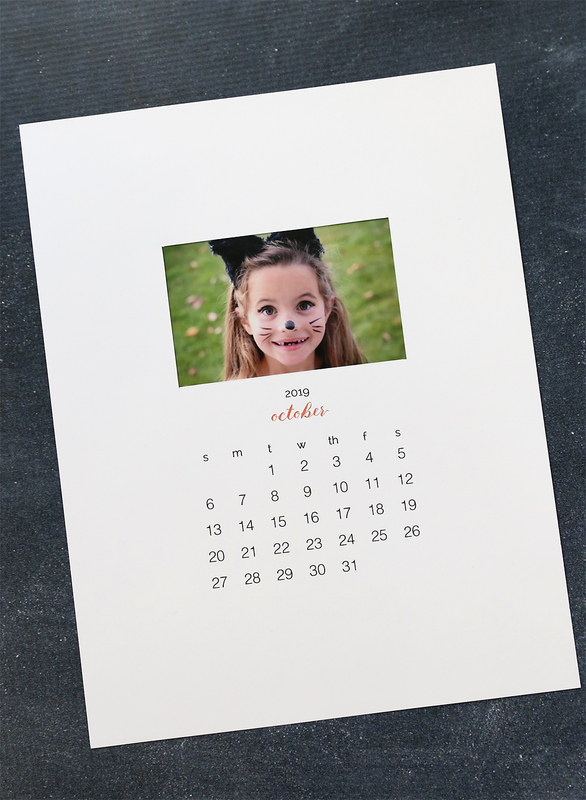 If you want to give the calendar pages in a frame, either purchase an 8.5×11 document frame, or trim 1/2 inch off the top and bottom of each page and 1/4 inch off each side so they’ll fit an 8×10 frame. 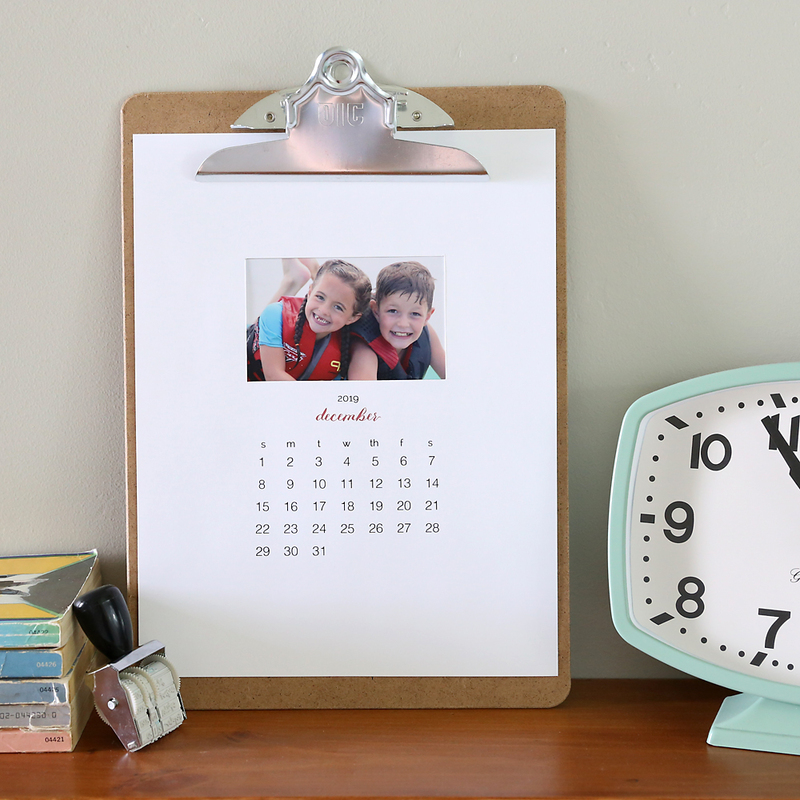 Either way, this personalized calendar makes a very pretty DIY gift. Just imagine how much fun Grandma will have looking at a new picture of her grandkids each month, or how excited Dad will be to show off pictures of his family at work. If you’d like to use beautiful, free stock photos in these calendars instead of family photos, check out Stock Snap. 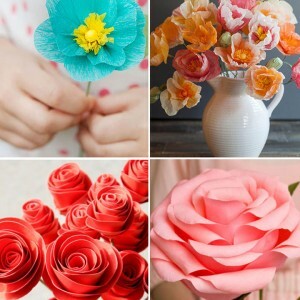 It has a searchable collection of beautiful photos that are absolutely free to use. 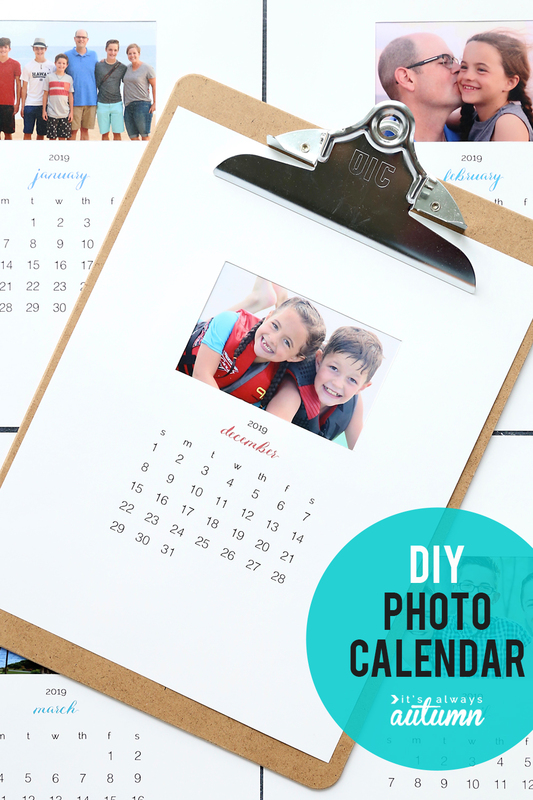 This way you can make a more generic photo calendar to give to friends and coworkers. Download the 2019 Photo Calendar Pages by clicking here. Looking for more handmade gifts? 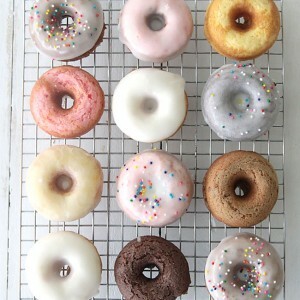 Visit these posts! Thank you so much for sharing this again this year. This is my favorite calendar. It makes wonderful gifts. Is it possible for me to get a blank calendar that has sufficient space for adding names on any or all days that a peron’s name can be entered (as many as six names on any one date) so I can make calendars for our whole family. Each family member must present to me the various birthday dates, anniversary dates, and any other significant date (with a symbol to denote what the date means: Bell for anniversary, birthday with a symbol to indicate the person is deceased, name only to indicate it is his/her birthday). I promised my family members who used to get such calendars when my organization sold such calendars annually. They now do not solicit the “names” for the annual calendar and I want to make my own. Please HELP! Thanks. Hi, I like this idea for make a present but I don’t know where can I find these types of calendar. Can you give me a link or the web-site where you found it please? much LOVE !! thank you for this calendar i’ve been looking for it ! it’s a great add-on Christmas gifts and new year gifts! and one for a close friend with his recent euro-trip and turned out amazing ! I like your idea. I advise you to look at this program: http://photo-calendar-software.com/. I so do calendars from my photos. It’s very simple. There are many templates in the program. Then this calendar can be printed. I was wondering if you had any printables to help you keep track of money and credit card receipts? Thank you so much for doing this again. I am retired so money is tight & this has become my go to Christmas gift for all my friends & family members using their own photos gleaned from social media posts. You are A.W.E.S.O.M.E. for doing this every year far enough before christmas that I can use it. Best wishes to you for a great holiday season this year. Hi, have you created the 2019 Mini calendar template? I was also looking for the 2019 mini calendar templates. I LOVE making these little calendars and appreciate your sharing them SO much. I simply love photo calendars! They look great and they always bring you good memories whenever you look at the date. tons of useful information, thanks for providing these statistics. Excellent web site. Plenty of useful information here. 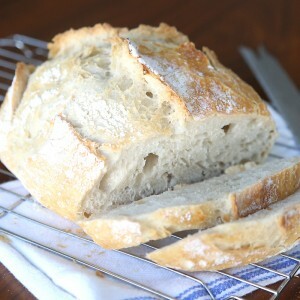 I’m sending it to some friends ans additionally sharing in delicious.